This week I’m in NC with my mother. She just had surgery. I’m playing Florence Nightingale while she recuperate this first week out of the hospital. As I thought about what to share on the podcast this wee, a certain phenomenon happening in my circle of influence came to mind. READING! Yep, you read that right! Lol!!! Reading is definitely the NEW GREETING. For the last few months I’ve recognized how important it is to stay in the books. Not just any books, however. The one’s that make doing business better, easier, more impactful (and the beat goes on). Now I’m an avid reader so I don’t want you to think the concept of reading is new to me. I read EVERY DAY. I’ve been on a big “better my business and the way I do it” binge lately. Confidence, certainty, credibility and Strategy are all affected by the pages in which you have your bookmark stuck. 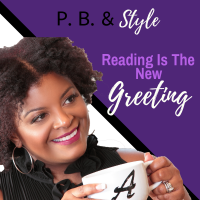 It’s not IF you read, but WHAT you read that makes reading the new greeting. In this weeks podcast, I’m talking about how people are starting, having, and ending conversations by inquiring about what you’re reading or have read. Leave your favorite books in the comments below and tell me how the knowledge has helped your business.